How much does it cost to travel to Tsavo National Park? How much money will you need in Tsavo National Park? KES11,579 ($114) is the average daily price for traveling in Tsavo National Park. The average price of food for one day is KES3,914 ($39). The average price of a hotel for a couple is KES6,743 ($66). Additional pricing is in the table below. These average travel prices have been collected from other travelers to help you plan your own travel budget. How expensive is Tsavo National Park? Tsavo National Park is one of the largest and oldest parks in Kenya, located in the central part of the country in what was once known as the Taru Desert. Human activity in the park dates back to the Late Stone Age making the park a major archaeological and historical site. 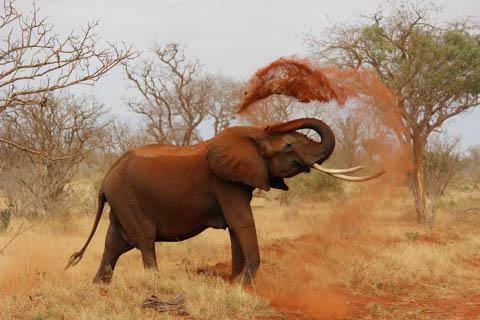 Tsavo is known for having beautiful natural landscapes and excellent game viewing. Tsavo experiences warm weather all year round, with temperatures ranging from 80-90° Fahrenheit during the day and dropping to the mid-70's at night. It tends to get very humid from December to April and their rainy period runs from March to May. January and February tend to be the best months to visit, with June through September being a good alternate option. Tsavo boasts many stunning natural landscapes, with one of the most popular being the Mudanda Rock. The Mudanda Rock measures almost a mile in height and collects water from rainfall which then flows through the rock to the dam below. The dam is often where you'll find large wildlife such as elephants coming to drink during the dry season. The Aruba Dam is another hot spot for game viewing and bird watching. The dam, built in 1952, runs across the Voi River and attracts animals such as lions, elephants, and cranes especially in the dry season. From here, head to the Yatta Plateau which was formed by the world's longest lava flow. The Plateau runs on the western part of the park above the Athi River and was formed by lava from the Ol Doinyo Sabuk Mountain. Tsavo is quite a large park and therefore has been divided into East and West parks. East Park is flat with dry plains and home to the Lugard Falls. The East Park is often considered to have the most quintessential African Safari experience thanks to their wide variety of wildlife and landscapes. West Park is more mountainous with swamps, Lake Jipe, and the Mzima Springs. The West Park is also known for their black rhino sanctuary and for being home to many of the large mammals. It is important to note that there are daily park fees for both parks which are best paid through the KWS Smartcard. The KWS is a card that can be purchased by your tour guide, or even your accommodation, to get you into the park. Make sure to have your card prepaid before arriving in Tsavo, otherwise you'll be going on a long, out of the way, trip to the park's headquarters. The main city outside of the park is Voi, which has become a major tourist hub thanks to its close proximity to Tsavo and other famous Kenyan landmarks. You'll find grocery stores, markets, and a few restaurants in the city center while most tourist lodges are located on the edge of the town. One of the best activities to do in Tsavo is game viewing, especially with Tsavo being one of the largest game reserves in Kenya. Here, you'll find the "Big Five" game viewing animals which are the Tsavo lion, black rhino, cape buffalo, elephant, and leopard. Tours can be booked through either your accommodation or a local tour guide. A great spot to see some of these animals is at the Mzima Springs in the West Park. The springs are made up of two large pools which are fed by underground streams running from the Chyulu Hills. Many hippos, crocodiles, elephants, and other such wildlife come here to drink the fresh water and cool off. If you're feeling adventurous, go rock climbing on the cliffs scattered throughout the park. You can contact the Mountain Club of Kenya (MCK) for more information on where to climb and get a guide if needed. Food options within the park are entirely based on your accommodation. There are plenty of lodges and camp sites throughout the park that include food in the cost of your stay. Just outside the park, in the city of Voi, there is the New African Smile Tabasamu Restaurant which serves delicious African cuisine. Here, you'll also find small restaurants and little grocery stores to stock up on snacks before heading out to safari. Tsavo can be reached by either plane of car. There are air strips inside the park for small light planes which you can catch from larger cities such as Mombasa and Nairobi. There are dozens of gates to drive into the park through depending on which city you're coming from. The main gates are Manyani when coming from Voi, Bachuma when coming from Mombasa, and Sala when coming from Malindi. Getting around the park is done primarily by car; you can hire a tour guide or go on group tours to get amazing sights of the park. Walking about the park is extremely limited and prohibited in certain areas due to the animals living in the park. Some tour companies do provide guided walking tours through the bush, although conditions have to be perfect in order to maintain your safety and the safety of the animals.